“Fire Worms From Outer Space!” was a game I wrote in the spring of 2009 as my final project for PH115 Science of Multimedia at MVCC. Play or get more info. Mouse-maze. The main technical interest is that it contains no scripting and is based entirely on CSS mouseovers. A basic 15-puzzle game. Probably not of much interest. See my Mac OS X screen savers page. Varychase is a graphics toy. Runs in the browser; wave your mouse around and it makes curly patterns. I originally wrote the option-less version May 29, 2010; September 25 I finally got around to adding a bunch of stuff, polishing the presentation, and publishing it. Linkage is a SVG animation based on a segmented line where the angles between segments vary — to the point of wrapping around and making curls — linearly along the line. Links are provided to change parameters of the animation. Bouncyworm is a SVG animation that, like Linkage, uses multiple nested transformations, but is less structured and just wobbles around. 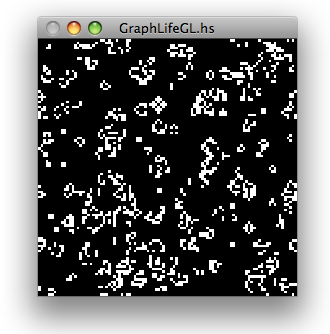 GraphLife is an impractically clever cellular automaton implementation in Haskell. It encodes the shape of the world, and the stepping rule, in the data structure. This is a sample of animation using the experimental HTML <canvas> element written for Rosetta Code. Note that as Rosetta Code is a wiki it may have been changed by others since I wrote it — hopefully for the better. 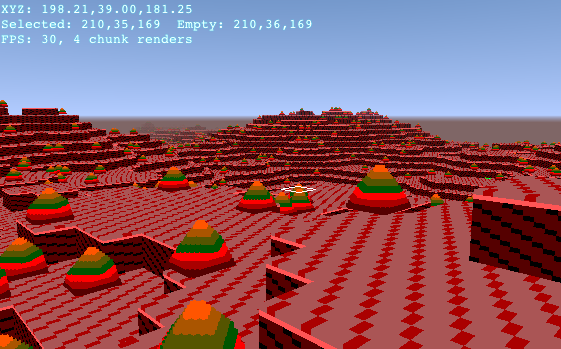 At one point I did a bit of doodling with the POV-Ray raytracer. My most elaborate project was an animation of the smartwheel as described in Neal Stephenson's book Snow Crash. An old favorite: How not to render 3D graphics: 40 ways to get a blank black screen by dmalcolm.